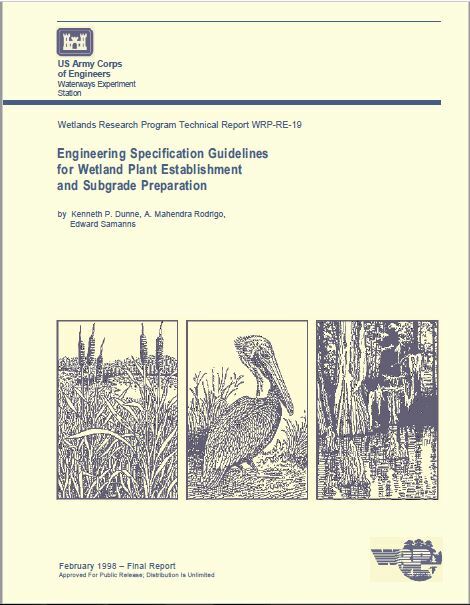 The?Engineering Specification Guidelines for Wetland Plant Establishment?and Subgrade Preparation document, put out by Louis Berger & Associates, Inc. for the US Army Corps of Engineers (Corps) in 1998 should be read at least once by any wetland restoration practitioners. ?If you’re doing projects, that probably means there are at least bid packages, design plans, permits, work process lists, and more, that you need to feel comfortable using. This reference is Free, and hosted here for easy access and download.